Great place, enough to keep the kids busy! Love the convenience to the festivities of Stone Mountain Park! Friendly gentleman at check-in. Nice spacious sites with peaceful atmosphere. Will definitely stay there again in the future! This is a historic Methodist Church Campground that is not used except on special occasions. Great management. Close to town. Security is great. Everything you need for a camp ground. Site #15 on the hill is great. It’s a small campground with very large camping sites and well placed through the area. All sites were really nice and most had separate area for an extra tent and trailer and eating area with fire pit and grill. Well maintained. We had woods directly across from us and no one around us. Bathroom facilities very clean, well kept with lots of light, heat and hot showers. Plenty of activities with hiking trails, 2 lakes for fishing, kayaking and paddle boats. Recommend the Marble Quarry hike. Falls were flowing great due to all the rain we had before. Trails around the lakes are nice and easy accessible. Loved the place and the people at the office were great and knowledgeable. With great views of Stone Mountain, close to hiking and activities, and right on the lake, this campground is very nice. It has plenty of amenities and a friendly staff. Where it falls short is at some of the sites. The fire ring and grill at our site (410, loop O) were not placed well; we never used them. Grill was right by the road, and the ring was too far forward. Both items would be better placed at the back of the site. It was quite a walk to get to the restroom. But, the shower and restroom were always clean. They have a laundry as well; very convenient overall. We enjoyed our stay and will certainly be back. This is one of my favorite places we’ve stayed! We were atStone Mountain over Memorial Day, they do an amazing fireworks show over the lake, which is great for kayaking (no motorboats allowed!!!) Great for bike riding too. Bathhouses are nice. We were in our pop-up, and had plenty of space. Highly recommend! We visited this park a few weeks ago with friends and had an amazing time! The park is set up on the land of an old factory that used the river to power a water wheel. There are a whole bunch of trails of varying difficulty and length that meander through the woods along the river. Along with the campgrounds there are also picnic benches and large group areas where you can host a lunch or dinner. We took the trail that shows you where they built the mill then goes along the river for a while. It was a beautiful hike but definitely challenging since there are a lot of rocks you have to climb over. The campgrounds are nice and across the road from the park through you can also take other trails from there that go down and around the reservoir. The amenities are nice and the whole park is well taken care of. I would highly suggest staying the night since it is such a short trek from the Atlanta area. Make sure to check out my video review below where I show you around some of the campground. This is much more of a mobile home or RV park than a campground since most of the people staying here are set up for long term residency rather than for a night or two. Additionally, it is right near downtown Atlanta so not exactly where I would want to spend the night if it wasn’t more of a home situation. If this is your purpose I would first check out the Atlanta West Campground down the street since it was significantly nicer in my opinion. This location seems mostly like a large parking lot where you can park and set up your site but there is not really any privacy or separation between different RVs. Only a couple miles away is Sweetwater State Park which is well worth a visit and has some wonderful hiking trails. Make sure to check out my video review first since it gives a good view of what is available at the site and a better overview of the different tent setups. 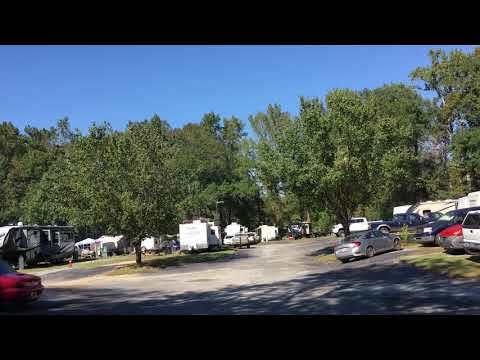 I passed through this campground while biking the Silver Comet trail with my wife and some friends and checked it out as a potential overnight option. It is a primitive site with two gravel platforms set up for tents each with its own firepit. The sites are rustic but well cared for and perfect if you are bike packing the trail and need a free place to stay overnight. 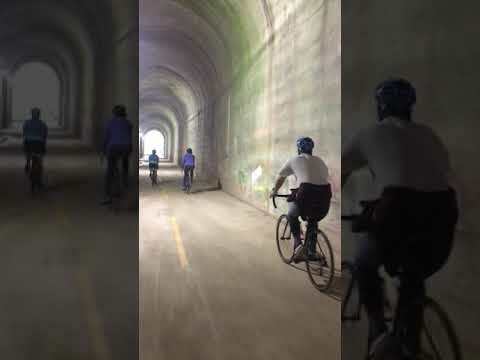 It is also only a 5 min bike ride in from two different trailheads on either side but only accessible from the trail and not connected to the road. This makes it a nice option since you will have much more privacy than any of the other options in the area. However, this also means you won’t have any of the facilities. There is a small seasonal creek that you could probably get water from in the spring when there is water available but it was totally dry when we were there in the fall. Overall, if you are looking for a “backpacking” like campground along the Silver Comet Trail this is a perfect option.